Please fill out the form below to request a product sample. Sample requests are not considered project submittal. Standard samples are available at no charge. 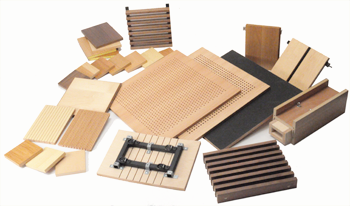 Custom samples may incur production and shipping charges due to availability. A representative will contact you regarding your inquiry and advise on any costs associated with the request. We thank you for your interest and look forward to working with you. I understand custom sample requests may incur a fee. I understand sample requests are not considered project submittal. I have read and acknowledge the disclaimer on the right side of the page. DISCLAIMER: Since wood is a natural material, it will vary from tree to tree or even within the same tree, resulting in grain, texture, and color appearance which may be different from issued samples. Finish samples represent the middle of the color range. Some planks or panels in a project could be lighter or darker than the sample. Acoustigreen does not guarantee that the color or grain will duplicate that of a sample. Barber Pole occurs in most species of veneers when book matched. It is prominent in rift and quarter cut oak. Barber Pole may lead to dissatisfaction on the job even when veneered products are manufactured to specification. Barber Pole is not evident in smaller samples. Slip matching veneers will minimize, but not eliminate, this condition. Acoustigreen is unable to honor warranty claims against Barber Pole. Wood is a natural material with character, color, and varying grain even in veneer taken from the same tree. When specifying clear finish, the natural characteristics of the veneer will be accentuated. In the absence of any stain, wood products will in all likelihood have a wide color range. Samples will not conclusively illustrate the color or the grain variations of a wood species.